Roger Ebert: The genius of the movie is the way is sidesteps all of the obvious cliches of the underlying story and makes itself fresh, observant, tough and genuinely moving. There is a vast difference between movies for 12-year-old girls, and movies about 12-year-old girls, and "Whale Rider" proves it. EW.com: There is, to be sure, nothing inherently controversial and everything admirable about a girl who saves the day by breaking the rules; meaningful tradition is a living, changing thing, without the evolution of which there’d be no women in the Christian and Jewish clergy, and no Cinderella Hollywood successes like ”My Big Fat Greek Wedding.” But when Koro instructs all the first-born sons of the tribe in ancient warrior arts, or when the men and women of the village labor together to save a group of beached whales, or when cinematographer Leon Narbey simply lingers on the silhouettes of massive wood carvings against the clouds, ”Whale Rider” emits a far deeper and more powerful pull than it does when it surfs the popular swells of chick rule. NYTimes: With a deft hand, the director bridges the disconnect between the modern touches in the village -- like the hilarious, cranky chatter over card games -- and the determination to cling to traditions. It is evident that tradition is the way the Whangara tribe maintains its spirituality, which defines it. The critical moment comes in a set piece that has the potential to send the film off into florid, find-your-bliss sentimentality: a whale cruises too close to the shoreline and needs to be steered back into deeper, life-sustaining waters. Ms. Caro refuses to oversaturate the film with anxious hyperdramatics. It is a moment in which she must show that she trusts her young star, a faith that pays off with a disarmingly touching climax. Great movie. Glad to see that it's on Netflix - need to check it out again. This movie makes me sob sob sob all through and I LOVE that cathartic quality of it. It's so easy to connect with the rejection and hurt that so many of the characters feel over and over again. There's something comforting in this movie's transition: in seeing a community that's just surviving at the beginning and not so gracefully in contrast to the one at the end. There's no clarity in the legacy of chief at the beginning. The rejected sons are lost. One creates a new life in another culture, expressing himself with art his father refuses to understand or even consider. The other successful in his youth as a fighter, now flounders, smoking pot in the sun with his friends. And then there's the other sons in the community, each with their own issues that have disconnected them from their tribal bonds. All the little details that tell us so much about everyones' hurt! So the teen grand daughter, painfully abandoned by her father, loved despite her gender and birth by her grandfather, but blamed for all the misery around them, is then able to find the strength to push and push through tears against all that multi generational sadness until she ultimately revives and leads the tribe to a place grounded in their traditions and able to face forward. So completely hopeful! Part of me just watches this and escapes into the beauty of the landscape, into this culture so different from my own. You can almost feel the blue salt water! But another part of me reflects on my own community's pain here in modern day America where we are also surviving not so gracefully and teenager activists are pushing through generations of pain and inaction to hopefully lead us to a place more grounded. Aaaaaand I start sobbing all over again. I know I shouldn't watch another culture's experience and reflect on how it involves my own world, but I did anyway. I want to feel that hope for my own future. I want to feel grounded in our cultural traditions and be able to face forward in strength. I want that transition for my own hurting community. Thanks for posting, but it looks like it's off Netflix again in my area at least (Texas, USA). I looked up on CanIStreamIt to see if it's streamable anywhere else but it just cycles. Anyone know what's up with that site? It doesn't seem to work like it used to. Thanks again for posting I loved rewatching this film. Thank you for all these wonderful links! 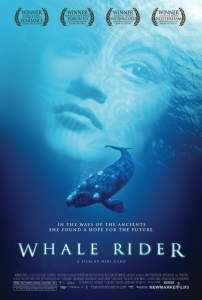 Whale Rider is in my top 10 of best movies ever. I don't usually re-watch movies - but this one I can watch over and over and still find it beautiful and moving.